Healthy Children > Stop the Measles! ​Vaccination is the single-best way to protect our children from measles—a very serious respiratory disease that is contagious. In recent years, the United States has faced several measles outbreaks as a result of poor immunization coverage. 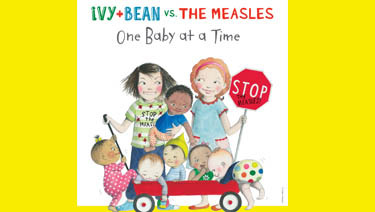 To prevent future breakouts and educate parents, children, and the community about why the measles vaccine​ is so important, the American Academy of Pediatrics (AAP), Measles & Rubella Initiative (M&RI), and other partners offered educational materials, featuring the precocious duo, Ivy and Bean, for doctors, schools, child care centers, and other child health providers in early 2017. In less than 6 months, we distributed over 1,000 kits to 49 US states, Washington, DC, and Canada! While the physical materials have run out, pediatricians, parents, and other child health caretakers, can still download coloring sheets from the campaign below. If you have questions about the campaign or global immunizations, please email globalvaccines@aap.org​.